To assist with planning, registration is required for special events and training workshops. 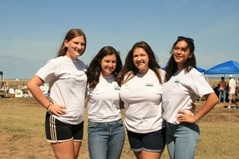 For information about these or other volunteer opportunities, please call 732-842-4000, ext. 4283, or email Tracy Shiffman at volunteer@monmouthcountyparks.com. Wednesday, January 16 from 10 a.m.-12 p.m.
Saturday, January 19 from 10 a.m.-12 p.m. Become an Environmental Center Docent! Join us for a tour of the facility, its operations, and an overview of the volunteer docent position. Training available for volunteers that sign up at the Open House. Assist Park Naturalists with greeting guests and various nature activities. Wednesday, February 6 from 1-3 p.m. 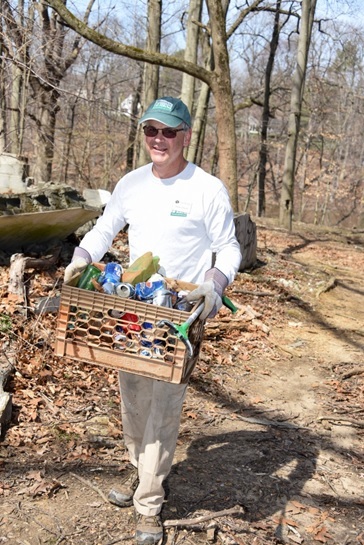 Learn about the many unique opportunities the Volunteer In Parks Program has to offer. T uesday, February 19 from 10 a.m.-12 p.m.
Join us for a tour of the Deep Cut Garden – Monmouth County’s only formal botanical garden. Opportunities include both indoor and outdoor options and working with people or plants or both! Training available for volunteers that sign up at the Open House. Tuesday, February 19 from 1-3 p.m.
Join us for a tour of Huber Woods. Opportunities include both indoor and outdoor options and working with people or plants or both! Training available for volunteers that sign up at the Open House. Sunday, March 10 from 8 a.m.-1 p.m.
Race assistants needed to support activities. Saturday, March 16 from 10 a.m.-12 p.m. Become a Trails Team Member and help maintain over 140 miles of trails in the Monmouth County Park System. Members are required to attend one of our training workshops prior to volunteering on the trails. Saturday, March 16 from 1-3 p.m.
Saturday, March 23 from 9-11 a.m.
Sunday, March 24 from 10 a.m.-12 p.m. Become a docent at this historical site! Join us for a tour of the Seabrook Wilson House – one of the oldest surviving houses in the region. Training available for volunteers that sign up at the Open House. Sunday, March 24 from 1-3 p.m.
Volunteer at your convenience! No advance registration. Help prune trees and shrubs, weed, mulch, and plant flowers in the parks! Please bring work gloves. April-October 1st and 3rd Thursdays each month at 8 p.m. Volunteers will assist Park Naturalist with catching and identifying moths. This activity must be done by shining bright lights in the dark to attract moths. They will be held in jars temporarily, so they can be observed for identification. Findings will be recorded for further analysis, reporting, and to help educate the public on the local moth population. Thursday, April 4 from 10 a.m.-12 p.m.
Saturday, April 6 from 1-2:30 p.m. Assist with coloring stations; backyard games; sports activities. Sunday, April 7 from 10 a.m.-12 p.m. Please bring work gloves and dress for the weather. Wednesday, April 10 from 10 a.m.-12 p.m.
Thursday, April 11 from 10 a.m.-12 p.m.
Thursday, April 11 from 1-3 p.m.
Sunday, April 14 from 10 a.m.-12 p.m.
S aturday, April 27 from 9 a.m.-12 p.m. This 55-acre site, the last undeveloped tract on the Manasquan Inlet, is a great place to fish, walk on the sandy trail, or go sunbathing. Volunteers will assist with cleaning up the natural trail, digging out invasive species, and removing litter from along the shore. Greet visitors and assist with set-up and take-down. TUESDAYS from 9 a.m.-12 p.m.
WEDNESDAYS from 9 a.m.-12 p.m.
THURSDAYS from 9 a.m.-12 p.m.
SATURDAYS from 9 a.m.-12 p.m. Volunteers will assist with a variety of creative projects. Saturday, May 4 from 7:30 a.m.-12 p.m. 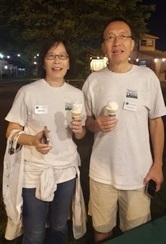 Volunteers will assist with event activities. S unday, May 5 from 10 a.m.-12 p.m.
Sunday, May 5 from 1-3 p.m. Volunteers are needed to help protect and monitor the endangered and threatened bird species nesting at the shore. 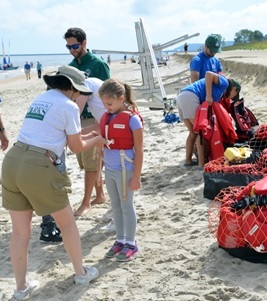 Training is required for volunteers and provided by Conserve Wildlife Foundation of New Jersey. Saturday, May 11 from 10 a.m.-12 p.m. Learn about our expanding bluebird monitoring program. The training session will include a slide presentation, followed by a walking tour of the bluebird nesting boxes and the purple martin colony at Thompson Park. Volunteers that attend this session can sign up to help monitor nesting areas throughout the Park System. Wednesday, May 15 from 10 a.m.-12 p.m.
Wednesday, May 15 from 8 a.m.-3 p.m.
T hursday, May 16 from 6-8 p.m.
Saturday, May 18 from 10 a.m.-12 p.m.
Sunday, May 19 from 10 a.m.-5 p.m.
Help us celebrate Historic Walnford! Assist with arts and crafts projects or historical games! Training provided. Wednesday, May 22 from 10 a.m.-12 p.m.
Saturday, May 25 from 1-4 p.m. Volunteers will assist Park Naturalist staff in building giant papier mache ants and other creatures which will adorn the Tent at the 2019 Monmouth County Fair. Volunteers may return to paint the insects on Friday, June 7th between the hours of 10 a.m.-3 p.m.
Saturday, June 1 from 9 a.m.-12 p.m.
TBA from 9 a.m.-12 p.m. 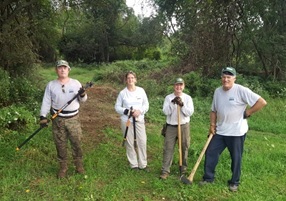 Assist Park Naturalist staff during the event. Saturday, June 8 from 10 a.m.-4 p.m. Assist with greeting guests, tours, and other activities. Thursday, June 13 from 6-8 p.m.
Saturday, June 15 from 2-5 p.m.
Sunday, June 16 from 2-5 p.m.
Thursday, June 20 from 10 a.m.-12 p.m.
Tuesday, June 25 from 9:30 a.m.-12 p.m.
Mondays, Wednesdays & Fridays (June 24 through August 23) from 11 a.m.-12 p.m. Assist Park System Naturalists in exploring the fish and crabs that live in the bay. Training provided. Thursday, July 4 from 7:30-11 p.m.
Help protect the endangered bird nesting areas during the 4th of July fireworks display. Training for volunteers on site before the event. Registration required. Tuesday, July 23 from 9:30 a.m.-12 p.m.
Our biggest event of the year! Assist with various activities. Greet guests and assist with refreshments. Assist with activities including greeting guests, fishing, kite flying, sand casting, kayaking, seining and much more! Saturday, September 28 from 9 a.m.-12 p.m. Assist at various obstacle course stations, cheering on the participants. Sunday, September 29 from 10 a.m.-5 p.m. Assist with various activities throughout the park. Saturday, October 5 from 7:30 a.m.-12 p.m.
Help with registration, set-up and check-in bikes, assist with canoes and kayaks, and water stations. Join us for an entertaining environmental program designed to celebrate the fall season with an evening hayride and mysterious nocturnal creatures along the way. Training required; dates will be announced in early September. Assist with event activities such as greeting visitors, pumpkin painting, scarecrow contest, wagon rides, crafts, portable rock wall, canoes, golf, and the Strut Your Mutt Costume Contest.